Google's calculator is more than an ordinary number cruncher. It can calculate both basic and advanced math problems, and it can convert measurements as it calculates. You don't even need to restrict yourself to numbers. Google can understand many words and abbreviations and evaluate those expressions, too. 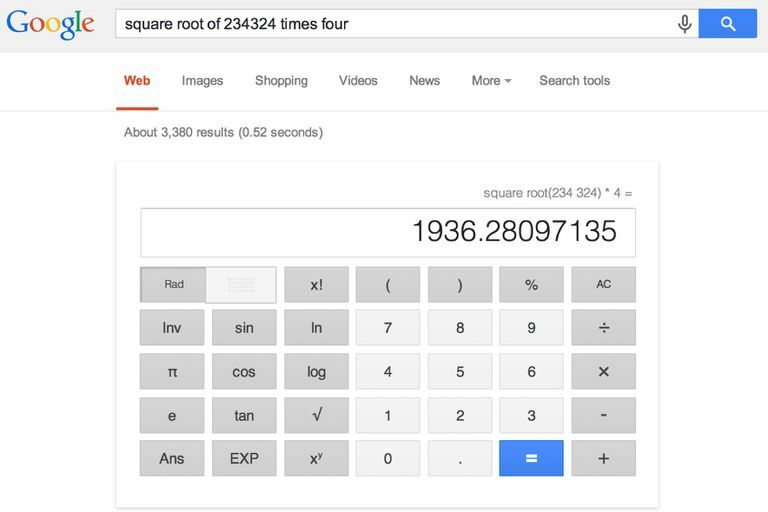 Google's calculator was designed to solve problems without a lot of math syntax, so you may occasionally find calculator results when you didn't even realize you were searching for the answer to a math equation. and Google will return the result three plus three=six. You know your results are from Google's calculator when you see the picture of the calculator to the left of the result. or the sine of 30 degrees. finds the number of possible choices of 7 items from a group of 24 items. Google can calculate and convert many common measurements, so you could find out how many ounces are in a cup. Google's results reveal that 1 US cup = 8 US fluid ounces. You can use this to convert just about any measurement to any other compatible measurement. You can also calculate and convert in one step. Find out how many ounces you have when you have 28 times two cups. Google says that 28 * 2 US cups = 448 US fluid ounces. Remember, because this is a computer-based calculator, you must multiply with the * symbol, not an X.
Google will probably confuse this with a phone number. You can force Google to evaluate an expression by using an equal sign. This only works for problems that are mathematically possible to resolve. You can't divide by zero with or without an equal sign. You can force parts of an equation to be resolved before other parts by enclosing them in parenthesis. choose X choose Y fines the number of possible subset groups of Y out of the set of X. % of finds percentages X % of Y finds X percent of Y.
! factorial - This must follow the number you wish to factor. The next time you find yourself wondering how much five liters is in gallons, rather than searching for a Web site for conversion, just use Google's hidden calculator. What's the answer to life, the universe and everything multiplied by the speed of light? What is the number of horns on a unicorn?